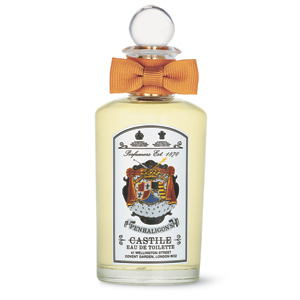 Penhaligon's is one of those small, almost lost English boutique perfumers. They conjure up images of trained 'noses' in half-rimmed spectacles;mixing tinctures behind counters for dandified Edwardian gents. They may wish to try and get away from this with their ever funkier labelling and more youthful concoctions, but why run away from your heritage is what I say. for many years now. Almost from its inception in 1998. Beautiful scent, complex yet not overpowering and subtle and fresh enough, with its citrussy notes, to wear during the day. Young Mrs Tweed has been known to splash it all over on occasion too. The shop in London's Covent Garden has lots of charm and wonderful unhurried service. Refined, English understatement. Let's put it this way, they won't be rushing out a scent with the name of celebrity in time for Christmas. Although a Tweed Pig range sounds good. I love Castile. It's woody, fresh, clean, lightly floral, long-lasting and restrained. Whatever the season, occasion or time of the day. Blenheim Bouquet is also nice with lavender, musk and citrus notes. Yes, I've tried Belnheim Bouquet - very nice. And for the day, English Fern has a refreshing, clean scent.